HeyPlantMan! 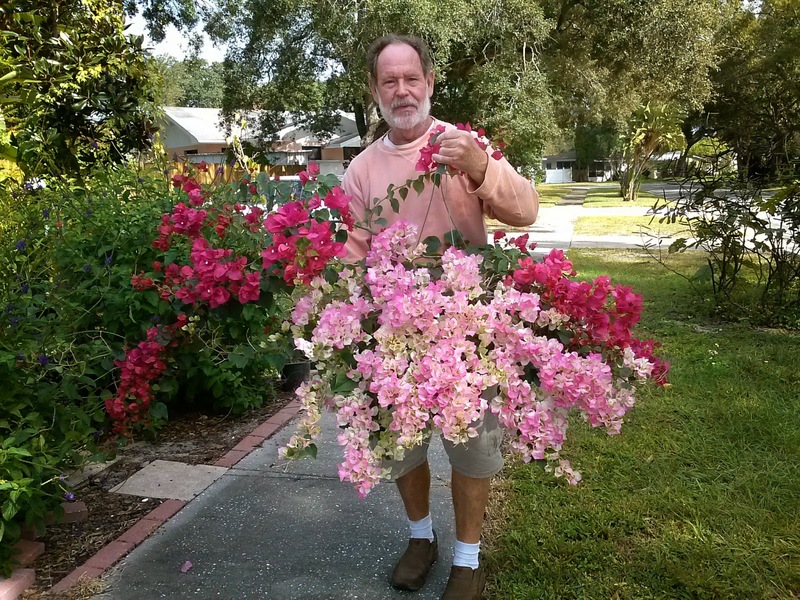 Exotic Tropical Plants from St. Pete FL: January 2016 is here ! January 2016 is here ! A very warm December ended 2015 and January is welcoming in some nice cool weather around our area, just in time to lift our spirits as it is so nice to work out in the nursery when the air is crisp. We always start the New Year with one of our favorite plants, the Bougainvillea. Whether in a hanging basket, on trellis or as a bush, it's such a versatile plant, that gives you ton of color all year long ! We are starting off the New Year with a bang with outstanding crowds at our home base, Saturday Morning Market, downtown St. Pete. This time of year also brings the beginning of "away" shows and events that we participate in. Whenever possible, if Mitch and I are away at a show, we try to have a crew to cover our spot at the Market. Sometimes that is not possible, and that's why it's important for you to stay in contact with our schedule via our website. The easiest way for you to stay in contact is by signing up for our weekly email. This simply can be done on the first page of our blog, on the lower right side. Simply put in your email, and you are set to get all communication. And rest assured, we do not have access to your email information and it is not shared with anyone or any other site. Sign up today ! This 3 day event down in Punta Gorda, one of our favorite towns, is a popular event with locals, garden clubs and snowbirds/tourist. We will be part of the MY Promotions group, setting up in this beautiful park right on the water. Free admission and parking. Lots of great vendors and live Music round out the deal. Event hours are Friday & Sat. 10am-5pm, Sunday 10am-4pm. Note: We will NOT be at Sat. Morning Market this weekend due to this show. That weekend, we will be covering 2 events, our regular Market, and also as part of the Arts & Craft Festival in beautiful Tarpon Springs on the docks. Note, the Tarpon Springs show is 3 days (Sat thru Mon). We hope you can make market and also, visit us at TS. The main street along the river by the docks is a favorite with locals and travelers alike. Lots of great vendors with the show, plus the Main Street is chalk full of great shops and great food. Starting in February, we begin our rounds of setting up at Botanical shows around the state, so stay tuned for details. And yes, we will be returning to Vero Beach Botanical Fest Feb. 6th !